For the 14 people who still expect Bill Murray to always behave like a wiseacre from "Ghostbusters," his appearance Friday night at the Orpheum Theatre must have been a snooze. 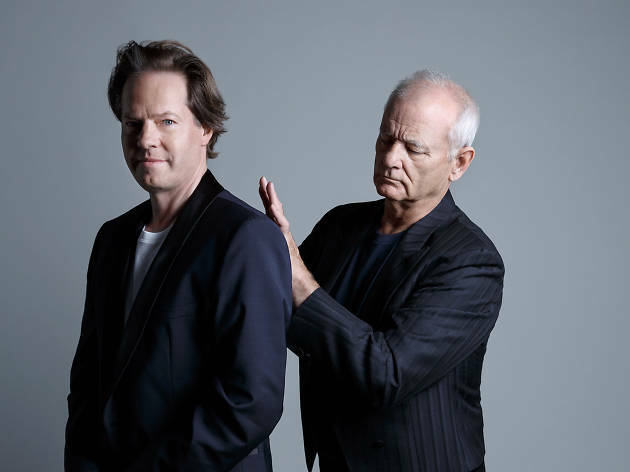 For everyone else, "Bill Murray, Jan Vogler and Friends" was just the logical next step in the beloved artist's endeavor to challenge and educate his flock. The evening, a two-hour mix of literary readings and numbers from the Great American Songbook, might have been ridiculed by members of the Algonquin Round Table, but Murray's sincerity was impossible to resist. He would never get past the audition round in "American Idol," but his timing unearthed new laugh lines in "It Ain't Necessarily So" from "Porgy and Bess" while his showmanship in Van Morrison's "When WIll I Ever Learn to Live In God" earned him a standing ovation. Murray also reminded us what a fine actor he can be, slipping subtly into distinct characters from Mark Twain's "The Adventures of Huckleberry Finn" and James Thurber's "If Grant Had Been Drinking at Appomattox." Renowned cellist Vogler, accompanied by pianist Vanessa Perez and violinist MIra Wang, gamely played along while sneaking in healthy helpings of Ravel and Bach. Those who were dying to see the wild n' crazy Murray didn't go away completely unserved. His version of "America" from "West Side Story" brought out shades of his lounge singer from "Saturday Night Live." Overall, though, this was a night where sophistication trumped silly. And that's a fact, Jack.